ThoroughCare simplifies reimbursements while helping you deliver the highest quality patient care. Want to Master MACRA at your Practice? Our free Whitepaper will show you how Medicare's care management and wellness programs help providers address their MACRA obligations. Watch our software demo to learn why practices everywhere are choosing ThoroughCare. If you're not using ThoroughCare, you're doing it the hard way! Technology should simplify your job, not complicate it. Our software solutions allow you to get set up and running in as little as 24 hours and train your staff in under an hour. Software designed for clinicians, by clinicians. Our design process includes real-life doctors and nurses to ensure that our software fits naturally into the way you work. Happier and healthier patients are good for business. Our software solutions are specifically designed to help you drive patient engagement and improve outcomes. It's never been easier to manage Medicare's most complex preventive programs. ThoroughCare gives practices of all sizes the right tools to effectively manage Medicare's profitable reimbursement programs. This popular program is for monthly non-face-to-face tasks, many of which you do today. Our CCM solution automates the consent, Care plan, reports and logging. 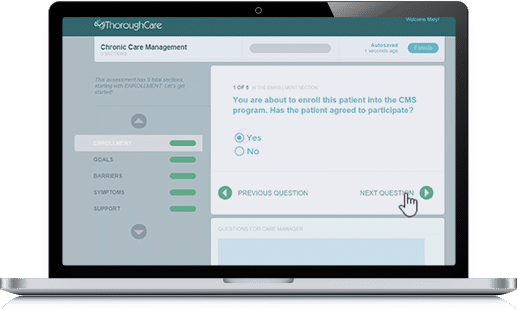 Similar to CCM, this program allows you to create care plans and manage monthly progress. Conditions include: Alcohol abuse, Substance Abuse, Depression, Anxiety and Mood Disorders. Managing your patients immediately after a discharge is critical. Medicare now reimburses you for these tasks, assuming you complete everything in the required time. ThoroughCare makes this easy. Our patient-centered care plan is ideal for managing a population. Identify your risky patients, while ensuring all are engaged. Great for alternative payment models like CPC+ and shared savings. Medicare places a significant emphasis on preventive care. From AWVs to screening and counseling services, there are many opportunities for you to promote to your patients. Our experience with ThoroughCare has been absolutely wonderful. They provide superior customer service. Since starting the Chronic Care Management program through their platform, we have made many positive impacts. We have increased our quality measure scores and reduced hospital readmits, resulting in a decrease in overall spend. Our providers are much more engaged with their patients care team. We're a healthcare software company with the goal of providing simple and intuitive solutions to providers. Founded in 2013, our software is used in over 350 practices across the United States. We work with groups as small as a 1-doc practice and as large as ACOs and health systems. Our team of healthcare entrepreneurs, clinicians and developers are passionate about building software solutions that are both Clinician Friendly and Easy to use. Several years ago, our practices loved our patient-centered-care-plan and wanted to use it for Chronic Care Management (CCM). Our CCM solution was a big hit, especially with smaller practices. Since then, we released solutions for Annual Wellness Visits, Behavioral Health and Transitional Care Management. These are all profitable programs that are difficult to do without the right tools. That's where we can help. We build easy-to-use software solutions so providers don't miss out on programs that are both profitable and good for their patients. Honesty and dependability are key to our operations. We listen for feedback, deliver on promises and seek open and transparent communication with our customers. Technology should make your life easier, not harder. We strive to make life easier for our customers with every product or feature we introduce. Healthy patients are happy patients. Everything we do is driven by our passion to improve the quality of life for every person we can.